After several decades of rapid technological advancement and economic growth, alarming levels of pollution and catastrophe-bound environmental degradations are emerging all over the world. Even sizable reduction in industrial pollutant emissions would only slow down the accumulation of pollution. 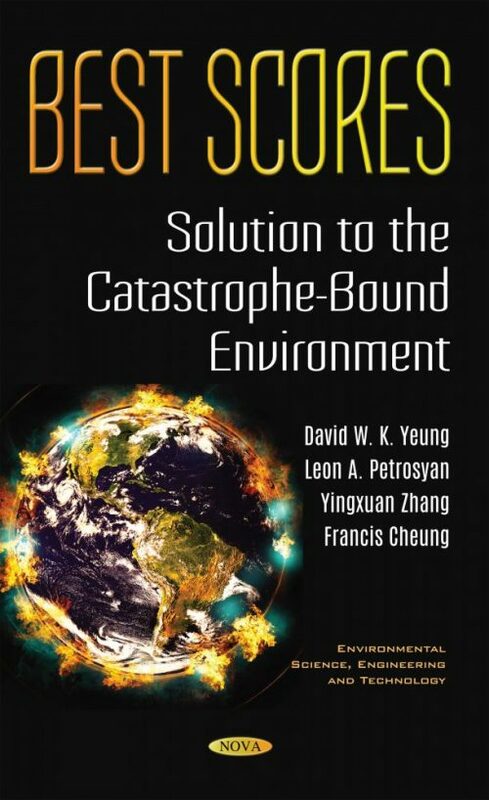 Given the complexity of the problem and the over-simplicity of international environmental initiatives (like the Kyoto Protocol, Montreal Protocol and Paris Agreement, which focused mainly on emissions’ reduction and regulations), limited success has been observed. The design of a comprehensive solution for solving this globally devastating problem is very much in order. Research in developing environmentally clean technology into efficient and affordable means of production plays a key role to effectively solving the continual worsening global industrial pollution problem and meeting the industrial growth needs. An essential element for success is that the participating nations’ well-being must not be worse than their non-cooperative well-being throughout the cooperation duration. In addition, for the cooperative scheme to be sustainable, the agreed-upon optimality principle in sharing the cooperative benefits must be upheld at every stage of the cooperation plan – this condition is known as subgame consistency. (i) A set of policy instruments which includes levies on industrial pollution, royalties on natural resources, coordinated pollutant abatement efforts, cooperative development of clean technology, and transfer payments leading to an optimal cooperation solution. (ii) Joint development of environmentally sustainable technology and an optimal technology pattern over time. (iii) A cooperative maximization program yielding the optimal (highest) joint payoff. (iv) An economically viable scheme for each participating nation with a cooperative payoff higher than its non-cooperative payoff through transfer payments. (v) A subgame consistent payoff distribution procedure, which ensures that the original agreed upon optimality principle in gain sharing will be maintained. Allen D. J., Nogués S. & Baker N. R. (1998). Ozone depletion and increased UV-B radiation: Is there a real threat to photosynthesis? Journal of Experimental Botany, 49, 1775-1788. Armstrong, B. K. (1986). Sunlight and malignant melanoma in Western Australia. In Stratospheric ozone, ed. J. G. Titus, 141-55. Vol. 2 of Effects of changes in stratospheric ozone and global climate. Proceedings of the United Nations Environment Programme (UNEP)/Environmental Protection Agency (EPA) International Conference on Health and Environmental Effects of Ozone Modification and Climate Change. Washington, D.C.: U.S. Environmental Protection Agency. Austin, J., Butchart, N. & Shine, K.P. (1992). Possibility of an Arctic ozone hole in a doubled-CO2 climate. Nature, 360, 221–225. Baadsgaard, O. (1991). In vivo ultraviolet irradiation of human skin results in profound perturbation of the immune system. Archives of Dermatology, 127, 99-109. Barnosky, A. D., Matzke, N., Tomiya, S., Wogan, G. O. U., Swartz, B., Quental, T. B., Marshall, C., McGuire, J. L., Lindsey, E. L., Maguire, K.C., Mersey, B. & Ferrer, E.A. (2011). Has the Earth’s sixth mass extinction already arrived? Nature, 471, 51–57. Basar, T. & Olsder, G. J. (1995). Dynamic Noncooperative Game Theory. 2nd. London: Academic Press. Benchekrouna, H. & Chaudhuri, A. R. (2014). Transboundary pollution and clean technologies. Resource and Energy Economics, 36, 601–619. Bhupendra, K. V. & Sangle, S. (2015.) What drives successful implementation of pollution prevention and cleaner technology strategy? The role of innovative capability. Journal of Environmental Management, 155, 184-192. Blackman, A. & Bannister, G.J. (1998). Community Pressure and Clean Technology in the Informal Sector: An Econometric Analysis of the Adoption of Propane by Traditional Mexican Brickmakers. Journal of Environmental Economics and Management, 35, 1-21. Böhringer C. & Vogt C. (2002). Dismantling of a Breakthrough: The Kyoto Protocol - Just Symbolic Policy! ZEW Discussion Paper No. 02-25, Mannheim. Bratberg, E., Tjøtta, S. & Øines, T. (2005). Do voluntary international environmental agreements work? Journal of Environmental Economics and Management, 50, 583–597. Brechet, T. & Meunier, G. (2014) Are clean technology and environmental quality conflicting policy goals? Resource and Energy Economics, 38, 61–83. Breton, M., Zaccour, G. & Zahaf, M. (2005). A Differential Game of Joint Implementation of Environmental Projects. Automatica, 41, 1737-1749. Breton, M., Zaccour, G. & Zahaf, M. (2006). A Game-Theoretic Formulation of Joint Implementation of Environmental Projects. European Journal of Operational Research, 168, 221-239. Carraro, C. & Massetti, E. (2010). Beyond Copenhagen: A Realistic Climate Policy in a Fragmented World. Note Di Lavoro, 2010.136. Fondazione Eni Enrico Mattei, Milan, Italie. Casse, T., Milhøj, A., Ranaivoson, S. & Randriamanarivo, J.R. (2004). Causes of deforestation in southwestern Madagascar: what do we know? Forest Policy and Economics, 6(1), 33-48. Church, J. A., Clark, P. U., Cazenave, A., Gregory, J.M., Jevrejeva, S., Levermann, A., Merrifield, M. A., Milne, G. A., Nerem, R.S., Nunn, P. D., Payne, A. J., Pfeffer, W. T., Stammer, D. & Unnikrishnan, A. S. (2013). Sea Level Change. In: Climate Change 2013: The Physical Science Basis. Contribution of Working Group I to the Fifth Assessment Report of the Intergovernmental Panel on Climate Change [Stocker, T. F., D. Qin, G.-K. Plattner, M. Tignor, S.K. Allen, J. Boschung, A. Nauels, Y. Xia, V. Bex and P.M. Midgley (eds.)]. Cambridge University Press, Cambridge, United Kingdom and New York, NY, USA. Clavreul, J., Baumeister, H., Christensen, T. H. & Damgaard, A. (2014). An Environmental Assessment System for Environmental Technologies. Environmental Modelling & Software, 60, 18-30. Day, T. A. & Neale, P. J. (2002). Effects of UV-B Radiation on Terrestrial and Aquatic Primary Producers. Annual Review of Ecology, Evolution, and Systematics, 33, 371-396. DCTI, EuPD Research & KPMG (2013). Cleantech-Standortgutachten 2013. In Anlehnung an BMU/Roland Berger 2012. De Gruijl, F. R. (1995). Impacts of a Projected Depletion of the Ozone Layer. Consequences, 1, 1-20. DESA (2005). Transfer of Environmentally Sound Technologies for Sustainable Forest Management – Framework and Applications. Department of Economic and Social Affairs, United Nations Forum on Forests Secretariat. Dockner, E. J. & Leitmann, G. (2001). Coordinate Transformation and Derivation of Open-Loop Nash Equilibria. Journal of Economic Dynamics and Control, 110, 1-15. Dockner, E. J. & Long, N. V. (1993). International Pollution Control: Cooperative Versus Noncooperative Strategies. Journal of Environmental Economics and Management, 25, 13-29. Dong, X., Li, C., Li, J., Wang, J. & Huang, W. (2010). A game-theoretic analysis of implementation of cleaner production policies in the Chinese electroplating industry. Resources. Conservation and Recycling, 54, 1442-1448. Doniger, D. (2009). The Copenhagen Accord: A Big Step Forward. NRDC Climate Center, 21 December 2009. Eerola, E. (2006). International trade agreements, environmental policy, and relocation of production. Resource and Energy Economics, 28, 333–350. El-Sayed, A. & Rubio, S. J. (2014). Sharing R&D investments in cleaner technologies to mitigate climate change. Resource and Energy Economics, 38, 168-180. Eyckmans, J. & Kverndokk, S. (2010). Moral concerns on tradable pollution permits in international environmental agreements. Ecological Economics, 69, 1814–1823. Farman, J., Gardiner, B. & Shanklin, J. (1985). Large losses of total ozone in Antractica reveal seasonal Cl0x/Nox interaction. Nature, 315, 207-210. Feenstra, T., Kort, P. M. & De Zeeuw, A. (2001). Environmental Policy Instruments in an International Duopoly with Feedback Investment Strategies. Journal of Economics Dynamics & Control, 25, 1665-1687. Finus, M. & Tjøtta, S. (2003). The Oslo Protocol on Sulfur Reduction: The Great Leap Forward? Journal of Public Economics, 87(9-10), 2031-2048. Finus, M. (2001). Game Theory and International Environmental Cooperation. New Horizons in Environmental Economics. Cheltenham: Elgar. Finus, M. (2004). International Cooperation to Resolve International Pollution Problems. Nota Di Lavoro, 41.2004, Fondazione Eni Enrico Mattei, Milan, Italie. Fleming, W. H. & Rishel, R. W. (1975). Deterministic and Stochastic Optimal Control. Applications of Mathematics, Vol.1, Springer-Verlag, New York, Heidelberg and Berlin. Foden, W. B., Butchart, S. H. M., Stuart, S. N., Vié, J.-C., Akçakaya, H. R., Angulo, A., DeVantier, L. M., Gutsche, A., Turak, E., Cao, L., Donner, S. D., Katariya, V., Bernard, R., Holland, R.A., Hughes, A. F., O’Hanlon, S. E., Garnett, S. T., Sekercioglu, Ç. H. & Mace, G. M. (2013). Identifying the world’s most climate change vulnerable species: a systematic trait-based assessment of all birds. Amphibians and Corals. Foxon, T., Gross, R., Heptonstall, P., Pearson, P. & Anderson, D. (2007). Energy technology innovation: a systems perspective. Report for the garnaut climate change review 2007. Available at: http://www. Frantzi, S., Carter, N. T. & Lovett, J. C. (2009). Exploring discourses on international environmental regime effectiveness with Q methodology: A case study of the Mediterranean Action Plan. Journal of Environmental Management, 90, 177-186. Fredj, K., Martín-Herrán, G. & Zaccour, G. (2004). Slowing Deforestation Pace through Subsidies: A Differential Game. Automatica, 40, 301-309. Gallagher, K. S. & Muehlegger, E. (2011). Giving green to get green? Incentives and consumer adoption of hybrid vehicle technology. Journal of Environmental Economics and Management, 61, 1–15. Gallagher, K. S. (2003). Foreign technology in China’s automobile industry: implications for energy, economic development, and environment. China environment series 2003. Woodrow Wilson Center for International Scholars, Washington, DC. Gallagher, K. S. (2006). Limits to leapfrogging in energy technologies? Evidence from the Chinese automobile industry Energy Policy, 34(4), 383–394. Gil-Molto, M. J. & Varvarigos, D. (2013). Emission taxes and the adoption of cleaner technologies: The case of environmentally conscious consumers. Resource and Energy Economics, 35, 486–504. Goussous, J., Siam, H. & Alzoubi, H. (2014). Prospects of green roof technology for energy and thermal benefits in buildings: Case of Jordan. Sustainable Cities and Society, 14, 425-440. Grossman, D. A. & Frieder, O. (2004). Information Retrieval: Algorithms and Heuristics (2nd Edition), New York: Springer. Guerin, T. F. (2001). Transferring Environmental Technologies to China: Recent Developments and Constraints. Technological Forecasting and Social Change, 67, 55–75. Häder, D. P., Worrest, R. C. & Kumar, H. D. (1991). Aquatic ecosystems. Chapter 4 in Environmental effects of ozone depletion: 1991 update. Nairobi: United Nations Environment Programme. Hanmer, R. (1997). Policy Approaches for Promoting Cleaner Production and Waste Minimisation in OECD Member Countries. Cleaner Production and Waste Minimisation in OECD and Dynamic Non-Member economies. Paris: Organisation for Economic Co-Operation and Development. Harrabin, R. (2012). UN Climate Talks Extend Kyoto Protocol, Promise Compensation. BBC Environment analyst, Doha. BBC Science & Environment, 8 December 2012. Haurie, A. (1976). A Note on Nonzero-Sum Differential Games with Bargaining Solutions, Journal of Optimization Theory and Applications, 18, 31-39. ICF (2006). Human Health Benefits of Stratospheric Ozone Protection. ICF (2010). Protecting the Ozone Layer Protects Eyesight – A Report on Cataract Incidence in the United States Using the Atmospheric and Health Effects Framework Model. IPCC (2007). Climate Change 2007: Impacts, Adaptation and Vulnerability. IPCC (2014). Climate Change 2014: Impacts, Adaptation, and Vulnerability- Summary for Policymakers. Jackson, T. (1994). Principles of Clean Production – Developing An Operational Approach To The Preventive Paradigm. In T. Jackson (ed. ), Clean Production Strategies: Developing Preventive Environmental Management In The Industrial Economy. Boca Raton, FL: Lewis Publishers. Jensen, P. A. & Bard, J. F. (2003). Operations Research Models and Methods. John Wiley and Sons. Jordan, A. & Werksman J. (1996). Financing Global Environmental Protection. In J. Cameron, J. Werksman and P. Roderick (ed. ), Improving Compliance with International Environmental Law, pp.247-255. London: Earthscan. Jørgensen, S. & Zaccour, G. (2001). Time Consistent Side Payments in a Dynamic Game of Downstream Pollution. Journal of Economic Dynamics and Control, 25, 1973-1987. Keohane R. O. (1995). Compliance with International Standards: Environmental Case Studies. In J.L. Hargrove (ed. ), Proceedings of the Eighty-Ninth Annual Meeting of the American Society of International Law, pp. 206-224. Buffalo, NY: Hein&co. Kirk-Davidoff, D. B., Hintsa, E.J., Anderson, J.G. & Keith. D.W. (1999). The effect of climate change on ozone depletion through changes in stratospheric water vapour. Nature, 402, 399-401. Kirkpatrick, A. J. & Bennear, L. S. (2014). Promoting Clean Energy Investment: An Empirical Analysis Of Property Assessed Clean Energy. Journal of Environmental Economics and Management, 68, 357–375. Kolstad, C. D. (2007). Systematic Uncertainty In Self-Enforcing International Environmental Agreements. Journal of Environmental Economics and Management, 53, 68–79. Labandeira-Villot, X. (1996). Market Instruments and the Control of Acid Rain Damage: Effects of a Sulphur Tax on the Spanish Electricity Generating Industry. Energy Policy, 24(9), 841-854. Larssen, T., Seip, H. M., Semb, A., Mulder, J., Muniz, I. P., Vogt, R. D., Lydersen, E., Angell, V., Dagang, T. & Eilertsen, O. (1999). Acid Deposition and its Effects in China: an Overview. Environmental Science & Policy, 2(1), 9-24. Lau, P. S. (2001). Study of Acid Rain in Hong Kong. Final Report submitted for the Provision of Service to the Environmental Protection Department, HKSAR (Tender Ref AS 99-417). IESD Publication 01-02. Less, C. T. & McMillan, S. (2005). Achieving the Successful Transfer of Environmentally Sound Technologies: Trade-Related Aspects. OECD Trade and Environment Working Paper No. 2005-2. Lin, B. Q. (2003). Electricity Demand in the People's Republic of China: Investment Requirement and Environmental Impact. Manila: Asian Development Bank. Liu, H. & Liang, D. (2013). A review of clean energy innovation and technology transfer in China. Renewable and Sustainable Energy Reviews, 18, 486–498. Liu, H. & Liang, X. (2011). Strategy for promoting low-carbon technology transfer to developing countries: the case for CCS. Energy Policy, 39(6), 3106–3113. Marrouch, W. & Chaudhuri, A. R. (2011). International Environmental Agreements in the Presence of Adaptation. Note Di Lavoro, 2011.035. Fondazione Eni Enrico Mattei, Milan, Italie. Mason, B. J. (1992). Acid Rain: Its Causes and Effects on Inland Waters. Oxford: Clarendon Press. Millock, K., Xabadia, A. & Zilberman, D. (2012). Policy for the adoption of new environmental monitoring technologies to manage stock externalities. Journal of Environmental Economics and Management, 64, 102-116. Minorsky, P. V. (2004). Effects of Ozone Depletion on Land Plants. Plant Physiology, 134(1), 16-17. Moustakas, C. (1990). Heuristic Research: Design, Methodology, and Applications, (1st Edition). California: Sage Publication,. Murdoch J. C. & Sandler T. (1997a). Voluntary Cutbacks and Pretreaty Behavior: The Helsinki Protocol and Sulfur Emissions. Public Finance Review, 25, 139-162. Murdoch J. C. & Sandler T. (1997b). The Voluntary Provision of a Pure Public Good: the Case of Reduced CFC Emissions and the Montreal Protocol. Journal of Public Economics, 63, 331-349. Ott, H. E., Sterk, W. & Watanabe, R. (2008). The Bali Roadmap: New Horizons For Global Climate Policy. Climate Policy, 8, 91-95. Paolo, F. S., Fricker, H. A., Padman, L. (2015). Volume loss from Antarctic ice shelves is accelerating. Science, 348(6232), 327-331. Pernick, R. & Wilder, C. (2007). The Clean Tech Revolution: The Next Big Growth and Investment Opportunity. NewYork: Harper Collins. Petrosyan, L. A. & Danilov, N. N. (1979). Stability of Solutions in Non-zero Sum Differential Games with Transferable Payoffs. Viestnik of Leningrad Universtiy, 1, 52-59. Petrosyan, L. A. & Danilov, N. N. (1982). Cooperative Differential Games and Their Applications, Izd. Tomsk: Tomskogo University. Petrosyan, L. A. & Zaccour, G. (2003). Time-Consistent Shapley Value Allocation of Pollution Cost Reduction. Journal of Economic Dynamics and Control, 27, 381-398. Petrosyan, L. A. (1977). Stable Solutions of Differential Games with Many Participants. Viestnik of Leningrad University, 19, 46-52. Power, W. V. (1987). Acid Rain: Calling for a Transboundary Solution. William & Mary Environmental Law and Policy Review, 12(1), 17-33. Prabu, V. (2015). Integration of in-situ CO2-oxy coal gasification with advanced power generating systems performing in a chemical looping approach of clean combustion. Applied Energy, 140, 1–13. Rai, V., Schultz, K. & Funkhouser, E. (2014). International low carbon technology transfer:do intellectual property regimes matter? Global Environ Change, 24, 60–74. Rignot, E., Jacobs, S., Mouginot, J. & Scheuchl, B. (2013). Ice-Shelf Melting Around Antarctica. Science, 341(6143), 266-270. Sangle, S. (2011). Adoption of cleaner technology for climate proactivity: a technology–firm–stakeholder framework. Business Strategy and the Environment, 20(6), 365–378. Shindell, D. T., Rind, D. & Lonergan, P. (1998). Increased polar stratospheric ozone losses and delayed eventual recovery owing to increasing greenhouse-gas concentrations. Nature, 392, 589–592. Singh, A. & Agrawal, M. (2008). Acid rain and its ecological consequences. Journal of Environmental Biology, 29(1), 15-24. Stavins, R. (2009). What Hath Copenhagen Wrought? A Preliminary Assessment of the Copenhagen Accord. HaRVARD Belfer Center for Science and International Affairs, 20 December 2009. Stimming, M. (1999). Capital Accumulation Subject to Pollution Control: Open-Loop versus Feedback Investment Strategies. Annals of Operations Research, 88, 309-336. Suzuki, M. (2015). Identifying Roles of International Institutions in Clean Energy Technology Innovation and Diffusion in the Developing Countries: Matching Barriers with Roles of the Institutions. Journal of Cleaner Production, 98, 229-240. Swanson, S., Bourgeois, T., Lampi, M., Williams, J. & Zalcman, F. (2005). Power Scorecard Methodology Report. Pace Energy Project, Pace University School of Law Center for Environmental Legal Studies. Tahvonen, O. (1994). Carbon Dioxide Abatement as a Differential Game. European Journal of Political Economy, 10, 685-705. Teramura, A. H. & Sullivan, J. H. (1994). Effects of UV-B radiation on photosynthesis and growth of terrestrial plants. Photosynthesis Research, 39, 463-473. Tol, R. S. J. (2010). Long Live the Kyoto Protocol. VoxEU.org, 23 January 2010. Toman, M. A. & Withagen, C. (2000). Accumulative pollution, “clean technology” and policy. Resource and Energy Economics, 22, 367–384. Triguero, A., Moreno-Mondéjar, L. & Davia, M. A. (2014) The influence of energy prices on adoption of clean technologies and recycling: Evidence from European SMEs. Energy Economics, 46, 246-257. UNEP (2010). Environmental Effects of Ozone Depletion and Its Interactions with Climate Change: 2010 Assessment. UNEP (2015). The UNEP Environmental Data Explorer, as compiled from United Nations Envrionment Programme. United Nations Environment Programme. http://ede.grid.unep.ch. UNEP (2016). The Evolution of the Montreal Protocol-Amendments. In Handbook for the Montreal Protocol on Substances that Deplete the Ozone Layer. (Online, accessed on 19 Oct 2016), Retrieved from http://ozone.unep.org/en/handbook-montreal-protocol-substances-deplete-ozone-layer/27608. UN Climate Change Conference (2016). Landmark agreement reached in Kigali to fight global warming. (Online, accessed on 19 Oct 2016), Retrieved from http://www.cop22.ma/en/landmark-agreement-reached-kigali-fight-global-warming. UNFAO (2010). Global Forest Resources Assessment 2010. United Nations Food and Agriculture Organization. (Online, accessed on 07 Aug 2015), Retrieved from http://www.fao.org/forestry/fra/fra2010/en/. UNFCCC (2007a). National Greenhouse Gas Inventory Data for the Period 1990–2005. In United Nations Framework Convention on Climate Change (ed.). UNFCCC (2007b). Sixth Compilation And Synthesis Of Initial National Communications From Parties Not Included In Annex I To The Convention. In United Nations Framework Convention on Climate Change (ed.). United Nations (1998). Kyoto Protocol to the United Nations Framework Convention On Climate Change. United Nations (2015a). The UN Climate Change Convention and the Kyoto Protocol. (Online, accessed on 02 Aug 2015), Retrieved from http://www.un.org/wcm/content/site/climatechange/pages/gateway/the-negotiations/the-un-climate-change-convention-and-the-kyoto-protocol. United Nations (2015c). Paris Agreement. USEPA (2012). Pharmaceuticals and Personal Care Products. Washington, D.C.: U.S. Environmental Protection Agency (EPA). (Online, accessed on 02 Sep 2015), Retrieved from http://epa.gov/ppcp/Valero and Valero (2010). Wang, X., Carmichael, G., Chen, D., Tang, Y. & Wang, T. (2005). Impacts of Different Emission Sources on Air Quality during March 2001 in the Pearl River Delta (PRD) Region. Atmospheric Environment, 39, 5227-5241. Weiss, B. E. & Jacobson, H. K. (1997). Compliance with International Environmental Accords. In M. Role, H. Sjöberg and U. Svedin (ed. ), International Governance on Environmental Issues, pp. 78-110. Dordrecht, The Netherlands: Kluwer. Werksman, J. (1997). Five MEAs, Five Years since Rio: Recent Lessons on the Effectiveness of Multilateral Agreements. Foundation for International Environmental Law and Development, Special Focus Report. London: FIELD. WMO (2011). Scientific Assessment of Ozone Depletion: 2010. Global Ozone Research and Monitoring Project-Report No. 52, 516 pp., Geneva, Switzerland, 2011. (Online, accessed on 06 Feb 2015), Retrieved from http://www.esrl.noaa.gov/csd/assessments/ozone/2010/citations.html. Yeung, D. W. K. (1992). A Differential Game of Industrial Pollution Management. Annals of Operations Research, 37, 297-311. Yeung, D. W. K. (2007). Dynamically Consistent Cooperative Solution in a Differential Game of Transboundary Industrial Pollution. Journal of Optimization Theory and Applications, 134, 143-160. Yeung, D. W. K. (2008). Dynamically Consistent Solution for a Pollution Management Game in Collaborative Abatement with Uncertain Future Payoffs. In D. W. K. Yeung and L. A. Petrosyan (Guest Eds), Special Issue on Frontiers in Game Theory: In Honour of John F. Nash. International Game Theory Review, 10(4), 517-538. Yeung, D. W. K. (2014). Dynamically Consistent Collaborative Environmental Management with Production Technique Choices. Annals of Operations Research, 220(1), 181-204. Yeung, D. W. K. & Petrosyan, L. A. (2004). Subgame Consistent Cooperative Solution in Stochastic Differential Games. Journal of Optimization Theory and Applications, 120(3), 651-666. Yeung, D. W. K. & Petrosyan, L. A. (2005). Subgame Consistent Solution of a Cooperative Stochastic Differential Game with Nontransferable Payoffs. Journal of Optimization Theory and Applications, 124(3), 701-724. Yeung, D. W. K. & Petrosyan, L. A. (2006a). Dynamically Stable Corporate Joint Ventures. Automatica, 42, 365-370. Yeung, D. W. K. & Petrosyan, L. A. (2006b). Cooperative Stochastic Differential Games. New York: Springer-Verlag, 242 pp. Yeung, D. W. K. & Petrosyan, L. A. (2008). A Cooperative Stochastic Differential Game of Transboundary Industrial Pollution. Automatica, 44(6), 1532-1544. Yeung, D. W. K. & Petrosyan, L. A. (2010). Subgame Consistent Solutions for cooperative Stochastic Dynamic Games. Journal of Optimization Theory and Applications, 145(3), 579-596. Yeung, D. W. K. & Petrosyan, L. A. (2012). Subgame Consistent Solution for Cooperative Stochastic Dynamic Games with Random Horizon. International Game Theory Review, 14(2), 1440012.01-1440012.29. Yeung, D. W. K. & Petrosyan, L. A. (2016a). A Cooperative Dynamic Environmental Game of Subgame Consistent Clean Technology Development. International Game Theory Review, 18(2), 1640008.01-1640008.23. Yeung, D. W. K. & Petrosyan, L. A. (2016b). Subgame Consistent Cooperation: A Comprehensive Treatise. Springer. DOI: 10.1007/978-981-10-1545-8. Zepp, R. G., Callaghan, T. V. & Erickson, D. J. (2003). Interactive effects of ozone depletion and climate change on biogeochemical cycles. Photochemical & Photobiological Sciences, 2(1), 51-61. Zwally, H. J., Abdalati, W., Herring, T., Larson, K., Saba, J. & Steffen, K. (2002). Surface Melt-Induced Acceleration of Greenland Ice-Sheet Flow. Science, 297(5579), 218-222.